Phyllis Jacobson, who died after a protracted illness on March 2 — just shy of her 88th birthday — was the dynamic force behind a remarkable political and intellectual partnership of shared passion that left an indelible imprint on three generations of twentieth century American radicalism. Phyllis, much like her future husband Julie, came to revolutionary socialism in her early teens. They met through the Trotskyist faction within the Socialist Party, later the Young People’s Socialist League, 4th International of the late 1930s after the split with the SP. There they, like so many of their radical comrades, many of whom — as they defected from their earlier commitments — became know as the New York Intellectuals, obtained a grueling political education in struggle not only with the much more influential Stalinists who dominated the left landscape, but with the mainstream Trotskyist faction who offered critical support to the Soviet Union long after the revolution was interred. Phyllis would later recall, with mixed pride and irony, that it was she who recruited her childhood friend, and future neo-conservative historian, Gertrude Himmelfarb, to the movement. Phyllis, like Julie, clearly shared with the New York intellectuals an ability to express herself eloquently and accessibly — without a hint of leftist cant — through a broad sweep of domestic and international political affairs, but differed from them in one crucial detail. They utterly lacked the requisite yearning for peer respectability. They accommodated their views to fit no political fashion; to curry favor neither with academia nor with any left mainstream. They fought against the war in Vietnam, without succumbing to illusions about Ho Chi Minh and the NLF; they struggled against American intervention in Nicaragua, without closing their eyes to the Sandinistas’s infringements on democracy; they fought against CIA- inspired overthrow attempts of Castro, while exposing the Castro regime’s repressive anti-democratic nature. They engaged the struggle for democratic unions, while condemning racism both in the ranks and in leadership policies of the labor movement. And they saw no contradiction in fighting for both at once. For that, they did more than most to save the good name of anti-Stalinism from the clutches of intellectual conciliators, apologists and outright propagandists of capitalism and reaction who were to emerge ever more dominant both on the liberal left as well as the neo-con right. If later radicalizing generations were to sentimentally embrace the memory of naively idealistic Communists fighting the good fight as premature anti-fascists, Phyllis was an early and persistent defector from that consensus. She retained bitter memories of these “sweet Stalinist grandmothers” who ripped Trotskyist leaflets from her and her comrades, shoved her to the ground and denounced them all as ‘Trotskyite’ whores and fascist agents. She remembered too how Julie’s Stalinist relatives once demanded of them an accounting as to how the ‘Trotskyites’ could justify their poisoning of Maxim Gorky. The rot of counterrevolution ran deep as she relentlessly reminded later generations, innocently inclined to forgive, what they never knew to forget. Writing about Lillian Hellman, Phyllis remonstrated, that Hellman and her Stalinist compatriots may not have actually engaged in much more than verbal violence, though their catalog of concrete crimes even on that level were certainly voluminous. But, if they were free of the actual physical crimes of Stalinism, and that more an accident of opportunity than of scruple, they nevertheless colluded in the larger political and intellectual cover-up. By promoting a totalitarian movement in the name of socialism, she and they had done enormous harm. They had impeded the development of an authentic socialist movement by distorting the basic concepts of socialism, promulgating the idea that a society based on the destruction of working class independence, on terror and the liquidation of millions was socialist. They not only distorted history but made a mockery of the American radical tradition. Theirs was a different type of violence, a lasting assault on the very soul of the modern emancipatory impulse that she and Julie dedicated their lives to repair. It was in the Workers Party — the third camp tendency, sometimes simplistically and misleadingly known as the Shachtmanites — that Phyllis and Julie first came to know one another. One from the far reaches of the Northern Bronx, the other from the hinterlands of Brooklyn, the sheer geography posed a difficult challenge in sustaining a relationship. Two hours each way on the subway, Herb Hill once recalled, was the death of more than one movement romance. When the Independent Socialist League dissolved itself in the late 1950s and merged with the Socialist Party, Phyllis briefly became the SP’s Manhattan organizer. Julie joined so briefly, that many years later, he actually had no memory whatsoever of having ever belonged. Phyllis’s membership ended rather early as she grasped that the vaunted regroupment strategy that Shachtman sold as the basis for unification—to prepare a neutral ground to pick up the remnants of the disintegrating Communist Party after the Khrushchev revelations and the invasion of Hungary—was fast becoming a cover for abandoning socialist politics. When, a few years later, she returned to the SP office, now little more than a George Meany patronage machine, to reclaim bound volumes of the New International (the WP/ISL theoretical journal), she was met with unexpected resistance by the few “old, young men” — as she put it — who ran the office. Brooking no argument, she proceeded to spirit away the entire stock, stating firmly that it was the intellectual and financial contributions of her movement — not theirs — that gave her the moral right to do so. When asked why she and Julie never joined any subsequent grouping, Phyllis responded simply that they had participated in the most stimulating sect that they could ever imagine, but that they had no further interest in entrapping themselves into another sectarian shell. These, in her opinion, bred a self-destructive “lack of civility among comrades and friends” and a self-isolating sense of misplaced moral superiority. 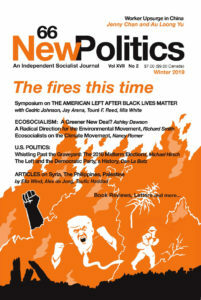 New Politics was envisioned as a way to break out of that shell, to create an arena for cross pollinating the wealth of political experience and insight that the WP/ISL had fostered with broader activist movements for change among other healthy radical traditions, among labor movement insurgents, the militant wing of the civil rights movement of the early 1960s and the emerging new left. The journal continues its long tradition of encouraging wide-ranging debate, with writers having extensive freedom to express views the editors disagree with. Of the two Jacobsons, Phyllis was clearly the more outgoing. Intellectually, they were joined at the hip. They struggled together over every phrase, every nuance and tone of each other’s writings. Julie freely admitted — and without a hint of patronization— that Phyllis was a very real coauthor with him, his indispensable editor, and his critical eye. And one can easily see this in their writing styles, as close as two different individuals might conceivably be. It was Phyllis who handled the day-to-day work of the journal. She cajoled authors and financial contributors to meet deadlines. She had the unique tact to convince often thin-skinned writers to accept editorial suggestions, and, when rarely necessary — editorial fiats. She maintained and meticulously updated the vast rolodex of contacts, donors, and subscribers. She coordinated the layout, printing and distribution. And she, unlike Julie, was the real schmoozer, with a rollicking laugh so infectious that rare indeed were those who could resist joining her. Phyllis enjoyed relating, as few political obsessives can, to a range of cultural and epicurean topics that permitted her to engage simply and naturally both to the radical and to the political bystander alike. Phyllis truly was — in that much abused phrase — the life of the party. This did not mean that she lacked a temper, nor an unyielding sense of political propriety. She, unlike Julie, never forgave Irving Howe and Lewis Coser from colluding with the publisher in demoting Julie to “an assistant” in the publication of The American Communist Party. Julie had done remarkable research for this volume. But they had academic ladders to climb — Julie was only a machinist– and the publisher in any case would only list two authors. So Julie was listed as a “co-author in all but name.” Forty years later, Phyllis still declared this episode a “disgrace.” And “disgrace” remained the ultimate denunciation. Phyllis memorably upbraided a prominent left scholar from the audience, who qualified his defense of affirmative action in a circumstantial cloud, by declaring quite audibly that his utterances were “simply disgraceful.” An act of political chiropratics was instantaneously performed, a spine was straightened, and the equivocation forthrightly and apologetically retracted. That was symptomatic of the authority Phyllis could wield. Remarkably, however, this diminutive powerhouse did not formally join the editorial board — and then not as the co-editor — until the summer 1968 issue. Her inclusion was made without prior announcement and with no fanfare; her name simply posted in alphabetical order on the list of board members. In fact, up until that point, there were no women either on the editorial board or on its sponsors’ list! Phyllis had argued passionately and skillfully in defense of the ERA, when that was still a debatable topic, particularly among labor movement activists; and in defense of the feminist movement against former comrades such as Irving Howe, whose “schmaltzy” defense of immigrant Jewish patriarchy — a microcosm of his larger evasion — left her particularly disgusted. She was quite conscious of coming out of a milieu, the neo-Trotskyist movement, which was, as she said, “far from generous to its women.” Yet, in a very real sense, it was the rising tide of the women’s movement that liberated Phyllis within the New Politics milieu. Even then, Phyllis only became a co-editor with the second series of the journal. It is a sad footnote that when the first series of New Politics ended in 1976, there were still no other women on the editorial board and only two women listed as sponsors, one of whom — Joanne Landy — had closely participated in New Politics since its inception. Still, the ongoing division of labor within the Jacobson family deprived the journal of the volume of literary output she should have otherwise produced. What we have of Phyllis’s writings constitute only a handful of articles, but memorable contributions all, and amongst the highest literary and political quality that the journal ever produced. Her writings on Stalinism, the American Communist Party and the Popular Front alone remain a unique source of political education for those who seek a concrete understanding of the nature of totalitarianism and the relationship of socialism to democracy. Phyllis — with Julie’s active participation to be sure — worked hard to see that the lack of women’s voices was not duplicated when the journal was resurrected a decade later. She campaigned for a properly consistent policy of gender, racial and generational diversity in the solicitation of contributors and in the choice of subject matter. And she never ceased to register her disappointment when these standards were not met. The last years of Phyllis’s life were heartbreaking to witness, a debilitating series of strokes that left her a shell of her former self — an ever cheerful and radiant political provocateur silenced, dependent and immobilized. Phyllis was visibly uncomfortable with sentimentality and it would be difficult to end on a note that violated her spirit. Her passing leaves a void of consistent polemical grace and unbounded political energies in the small, hard-pressed socialist movement of today that cannot easily be duplicated. She is missed. BARRY FINGER is a member of the New Politics editorial board.